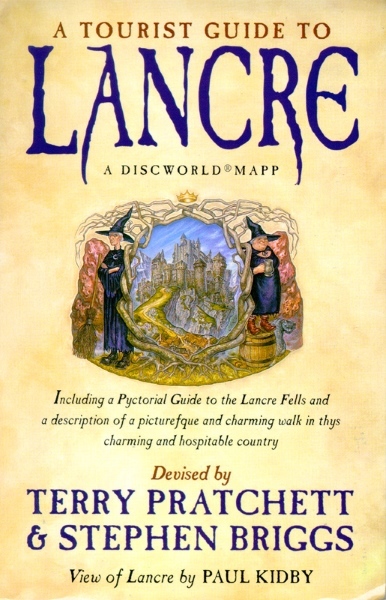 Not only an artistic and breathtaking view of Lancre but also an interesting and informative guide to one of the Discworld's more, er, picturesque kingdoms. Granny Weatherwax, Nanny Ogg and Magrat Garlick live there. Lancre could hardly be somewhere ordinary, could it? Magic glues the Discworld together and a lot of it ends up in Lancre, principal Kingdom of the Ramtop Mountains. Between Uberwald and Whale Bay, the Octarine Grass Country and the Widdershins Ocean lies the most exciting and dangerous terrain in all Discworld. The Ramptops supply Discworld with most of its witches and wizards. The leaves on the trees in the Ramtops move even when there is no breeze. Rocks got for a stroll in the evening. Even the land, at times, seems alive. The mapp may only be two-dimensional, but watch it very carefully and you might see it jostle about a bit.